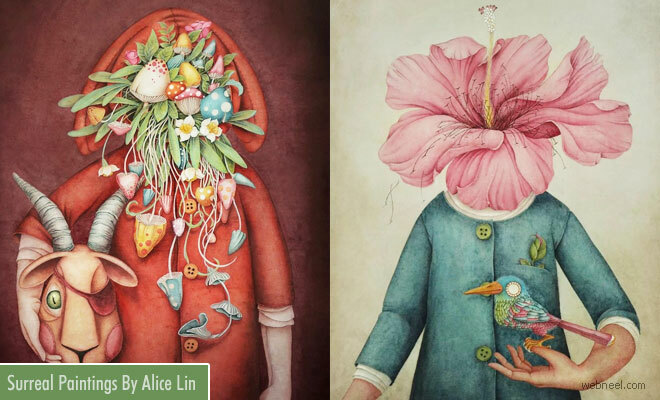 Alice Lin is an artist from Beijing, China. She never stops to amaze us ith her surreal watercolor paintings. She has portrayed the human body so beautifully using the ancient chinese painting techniques in a surreal contemporary art. If you look deeper into her watercolor paintings, you can see the magic transform in front of your eyes. There are no faces in her painting, yet each one is unique for it's surrealism and creativity. The choice of vibrant colors and textures is pleasure to watch. Alice Lin was born in 1980 and she currently works from Beijing. As a child Alice studied calligraphy, Chinese painting and classical poetry, all of these disciplines still inform her work to this day. Alice has previously worked within the 3D effects industry and is now focusing her talents on her fine art and freelance illustration. Her paintings are an exploration of the inner self and environment. According to Alice Lin, " Our body is a container, connected to the outside world and our breath, blood, thoughts, feelings, emotions, dreams, etc. are the content; through this content we are able to experience life, and we are able to learn about art, the world or ourselves".